As I was shopping at my local high-end grocer the other day, I noticed a new snack product on the shelf near the organic lettuce where I found Snapea Crisps: Uncle Bud's Deep Fried Peanuts. There were a few varieties available, and I chose "Hot." According to Uncle Bud, these are "so good you can et 'm SHELL-N-ALL" (capitalization courtesy of Bud himself). Normally eating peanut shells would be quite terrible, but I was feeling adventurous. It was nearly 10:30 and I just had two beers, plus I was already in a mood for insomnia, so I figured "anything goes." The first peanut, shell-on, was nearly flavorless and spiceless, minus the slightest hint of garlic. Perhaps the gum I had been chewing just 10 minutes earlier was interfering. I ate on. Three peanuts in, the spice was barely growing. I was expecting to wake up in a cold sweat in the middle of the night with my innards on fire. It was time to try one without the shell. Luckily, many of the shells were split in half, just begging to be removed. Unfortunately, the minimal seasonings did not make it to the inner goodness, so the peanuts tasted plain, if not slightly altered. Well, now I had a lonely shell sitting there, and I was not about to waste it. Once again, garlic, spice -- a little bit more this time, particularly at the rear sides of the tongue -- and weird peanut shell texture. I ate the next peanut whole, and it tasted exactly like normal mashed potatoes. At this point, I was not sure what the hell was going on. 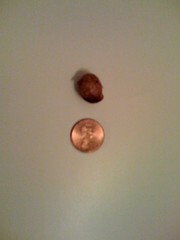 The most exciting thing that happened during my snacking was the discovery of a single peanut in a single-peanut-sized shell. Yet, somehow I ate on -- probably because these tasted a lot like normal peanuts, which are pretty damn good. And I did find myself eating them "shell n all" because the soybean oil must have softened the slightly charred shells up. Uncle Bud did one thing right, though: He found a way to get the spice to linger on the tongue for an extended length of time to increase snacking duration. In a nut shell: You should buy these if you love normal peanuts, are lazy and have a low tolerance for spice. did you eat the penny? omg a coworker brought these in today and i am addicted. what is the high end grocery store you found these in? i must have them. 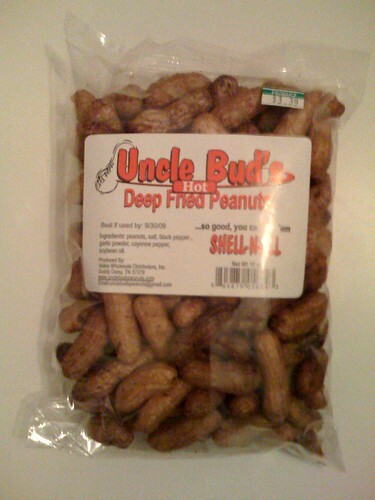 also this was the 5th search engine result for "deep fried peanuts" - you should blog more.